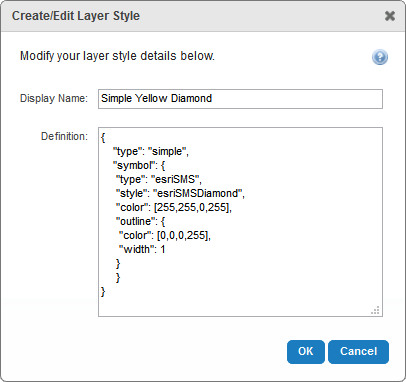 In Manager, create layer styles that end users can select in a list. Enable end users to create new layer symbology and turn the symbolization on and off. For information on how end users re-symbolize a layer, see User Experience. In the Display Name text box, type a name for the layer style. The display name can include spaces and special characters. The display name appears in the list of layer styles that end users select from. In the Definition text box, enter the JSON for an ArcGIS renderer. Essentials supports simple, unique value, and class breaks renderers. For information, refer to the ArcGIS documentation on renderers . Layer styles appear in the viewer in the same order that they appear on the Styles tab in Manager. In the list of layer styles, click and hold a layer style that you want to move to a different position in the list. Drag and drop the layer style to its new position. Continue to drag and drop layer styles until the list is ordered the way that you want it. To enable end users to create new symbolization for a layer and turn the symbolization on and off, turn on the layer's Allow Symbolization setting in Manager. The layer must be a feature layer or belong to a map service that meets the map service requirements for Dynamic Layers. For ArcGIS dynamic map service layers, we recommend that you do not use layer transparency for layers that users can re-symbolize. This is configured in the map service itself, not in Essentials. Layer transparency cannot be edited or removed by the user, and it may lead to a confusing user experience. For these services, use only symbol transparency. When a user configures symbolization for a layer, the new symbol replaces the layer icon that is configured for the layer in Manager. The user can turn the symbolization on and off. When symbolization is on, the user's symbol shows. When symbolization is off, the layer icon shows. To create new symbolization for a layer, the user clicks the layer in the layer list, and then clicks the Symbolization hyperlink in the Layer Actions Menu. This opens the Symbolize Layers panel, which has settings for the symbolization type (simple, class breaks, unique values), symbol shape, size, border and fill color, and transparency. To turn symbolization on and off, the user clicks the layer in the layer list, and then changes the Symbolization checkbox in the Layer Actions Menu. For more information, see LayerStyles Module and LabelOptions Module. Click the icon beside the map service to show the map service's layers. Click the drop-down menu icon beside the layer and select the Allow Symbolization checkbox. If you clear the Allow Symbolization checkbox, end users will not be able to change the layer's symbolization. Batch editing overwrites the existing configuration for every layer in the folder or service. The only way to restore the previous configuration after you click Apply Changes is to individually reconfigure each setting in each layer. Click the drop-down menu icon beside the map service. In the Batch Edit area, select the Allow Symbolization checkbox. If you clear the Allow Symbolization checkbox, end users will not be able to change the symbolization for any layer in the map service.